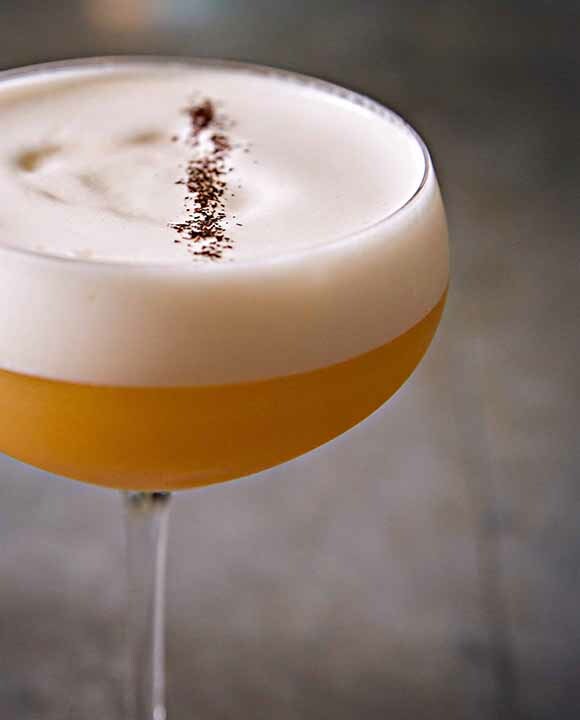 Tea tannins bring an underlying dryness to this frothy Cognac cocktail from Dallas. Combine the first 4 ingredients in a shaker and shake vigorously without ice to emulsify the egg white. Add ice and shake again to chill. Double strain into a coupe and slowly pour about 2 ounces of Champagne on top. Garnish. Earl Grey Tea Syrup: Mix 1 cup of boiling water and 1 cup of sugar and stir until the sugar is almost completely dissolved. When it reaches this point and the mixture is still super hot, add a few sachets of loose leaf earl grey tea leaves. Steep it for about 20 minutes to get the most concentrated flavor. Strain and let cool before using.